Your credit score is one of the most important 3-digit financial numbers you’ll use. Your credit score is used by lenders to determine how worthy of a borrower you’ll be. The higher your score, the better interest rates and terms you can get because you’re seen as a lower risk to the lender. It’s wise to always monitor your credit to know where you stand. What happens when your credit score actually seems to go down? The first step involves determining why. Then, you can decide on the proper action steps to take to increase it. Here are 5 common reasons why your credit score can decrease. This is one of the most obvious reasons why your credit score can decrease. Your credit utilization accounts for 35% of your credit score. It’s a huge factor and it’s often always changing. If you have a credit card or another revolving line of credit, your balance can go up or down. A good rule of thumb is to keep your balance at or below 30% of your overall credit limit. This means if you have a credit card with a $2,000 limit, your balance should never exceed $600. If your balance does go up and you don’t pay it off, you can expect to see your credit score increase the longer you carry a higher balance. Do you keep organized when it comes to recording every account you have, the balance, and the payment due date? Missing a payment can also decrease your credit score. We’re all busy, so it’s important to keep track of all your debt payments and monthly credit card payments. I almost missed a credit card payment because I forgot that two of my credit cards had annual fees that were due. It can be helpful to sign up for email alerts so you can know when expenses like this pop up. You also might want to set up automatic payments for most of your bills and budget so you know you can afford the withdrawals when they occur. If you apply for new credit, the creditor will run your credit report and this will result in a hard inquiry. You can even receive a hard inquiry if you’re applying for a home or apartment that your renting or a new car that you’re financing. One hard inquiry alone often isn’t too damaging. However, too many hard inquiries can add up and cause your credit score to drop. If you’re applying for a home or car loan, the company you’re using can very well shop around with lenders in an effort to get you the best rate. Unfortunately, this can add 10+ hard credit inquiries to your report in a small time frame. Usually, these inquiries will only count as one because credit bureaus understand that you’re shopping around to get the best interest rate. However, you want to make sure this is the case and your credit report isn’t showing that you have several hard inquiries. Hard inquiries stay on your credit for at least two years so you want to avoid getting more than a handful at a time. Credit bureaus are not perfect which means they can make errors. In fact, about 25% of U.S. consumers revealed there had been errors on their credit report. 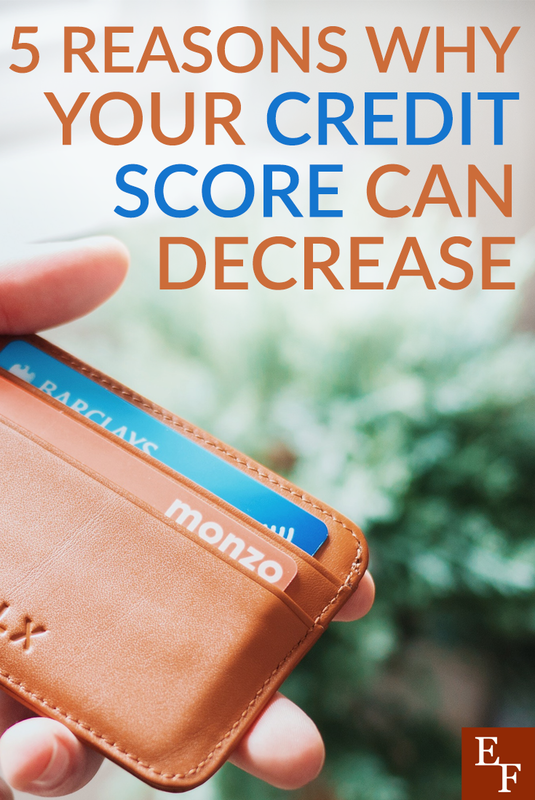 If you notice that your score suddenly dropped and none of the other reasons on this list applied, check your credit report in full to see if you can uncover an error. You can check your report annually with AnnualCreditReport.com or you can sign up for Credit Karma or Credit Sesame to monitor your credit score regularly. If you notice a sudden decrease, check your report to see if any new accounts or information was added by error. Paying off debt is often seen as a good thing. However, when you pay off an account or close a credit card, it can become one of the many reasons why your credit score can decrease. Your credit score is based on your credit history. When you close an account, you no longer have the history as it can disappear off your credit report after a few months. I remember this came as a shock to me when I paid down my car loan initially. It had a super high interest rate and I was so happy to pay it down. However, a few months after I paid my car off and the account closed, my credit score decreased by a few points. In the grand scheme of things, closing the account didn’t make a huge difference when it came to my credit. However, if you have a long-term loan, you can expect to see your score drop by a few points. To offset this, consider keeping a revolving line of credit open like a credit card. Choose a quality credit card to keep long-term. Even if you stop using it and your balance stays at 0, you can still keep it open so it can factor into your credit history. If you notice that your credit score suddenly decreases, don’t get too alarmed. There are several reasons why it could have happened and some of them may not be so bad. Remember that building your credit is a long-term effort. Your score may fluctuate over time but as long as you’re using credit wisely and monitoring for errors, your score shouldn’t ever change drastically. What are you thought about these common reasons why your credit score can decrease? Share them with us in the comments!